Warsaw's mayor told ABC11 on Friday that the officer did what he had to do. 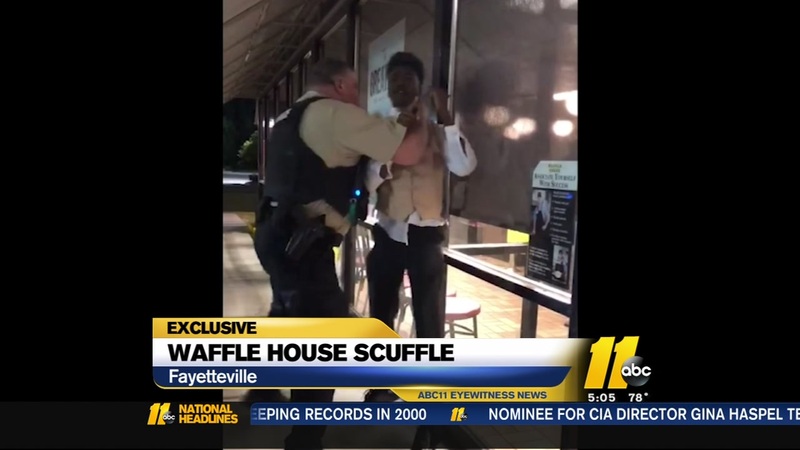 WARSAW, NC (WTVD) -- Waffle House CEO Walt Ehmer spoke Friday to the Fayetteville man who was put in a chokehold outside a Warsaw Waffle House after prom. And the mayor of Warsaw weighed in with a plea to let the judicial system do its job. According to a restaurant spokesperson, Ehmer said Anthony Wall was apologetic and respectful. This comes the same day the State Bureau of Investigation announced it was investigating the incident. It happened on Saturday outside of Waffle House. Anthony Wall, 22, claims he had just taken his 16-year-old sister to prom and went to grab a bite to eat when he said he got into an argument with several wait staff members. From there, police were called to remove Wall, which led to him being choked, slammed, and led away in handcuffs. "I was pretty much trying to scream for air and trying to breathe because he was holding my throat and that's when I got aggressive with him because you are choking me," said Wall. Warsaw police are investigating after a video went viral of one of its officers putting a man in a chokehold. Police said Wall was charged with resisting arrest and disorderly conduct. Many voiced their concerns and opinions about the incident on Wall's Facebook page. Just days later, the NAACP Legal Defense Fund spoke out, calling the actions of the officer "grossly inappropriate." AJ Connors, the mayor of Warsaw, spoke to ABC11 on Friday evening about the incident that has garnered national attention. "This officer did what he had to do," Connors said. "This is not a racially motivated issue. This was just a young man who had broken the law and a law enforcement officer arrested him and unfortunately, physical contact took place because he refused to obey the law." Connors said he has asked residents and others not to call the police department to tie up lines if they're trying to complain about the video. "(Wall) started a fight, and the officer's job is to make an arrest if there's a reason to," Connors said. "At this time, we're asking you to eliminate the pre-judging, allow the system that's in place to operate and do what it needs to do. We have a judicial system that works." We are looking into the incident that occurred at our Warsaw, NC, restaurant to gather all the facts. Initial reports say the customer became agitated, and the police were called. In an interview with WTVD-TV in Raleigh, NC, Mr. Wall said he took things too far with our employees. We continue to cooperate with the local authorities in their investigation. We refer any questions about the arrest to the local police department. On Saturday, officials said they believe there is "more to the story than the short videos that have been posted might suggest," adding that they do not believe race was an issue to call the police. Waffe House said they train their employee to act quickly (to call police) when they or customers feel in danger. 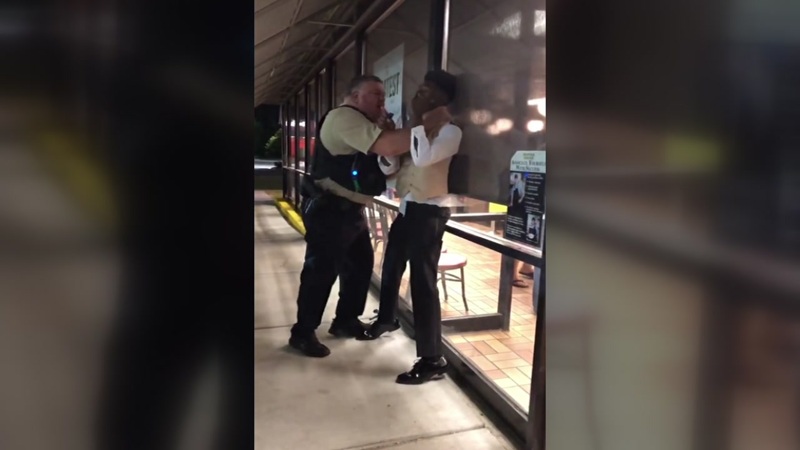 The NAACP Legal Defense Fund has responded to a viral video showing a Warsaw officer putting a man in a chokehold outside a Waffle House, calling the actions of the officer "grossly inappropriate." "We are currently investigating the whole incident, interviewing witnesses and gathering additional video. We have also reached out to the District Attorney's Office to make him aware of the investigation. Once the investigation is complete and the District Attorney has had a chance to review the case we will provide the public with an update on the findings."